The final eliminations before the final. Six stay, four leave. Right were we left off last time. CT vs. Leroy and Cara Maria vs. Laurel in Wrecking Walls. The men go first, and both fly up the wall. However, CT does so slightly faster and Leroy is sent home. Then we see Laurel face Cara Maira. 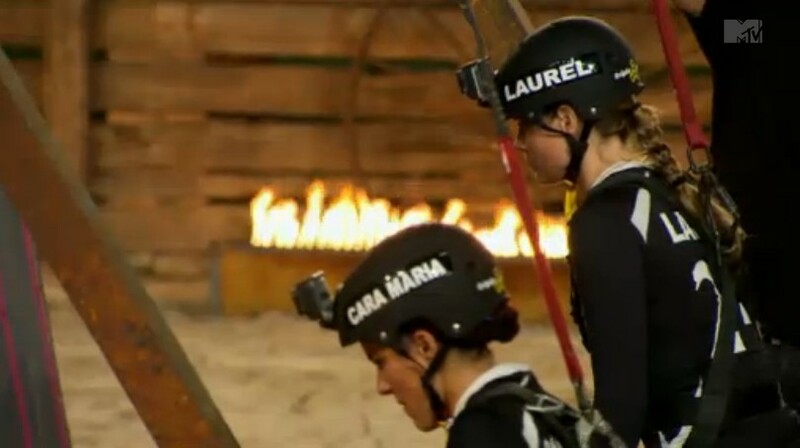 Laurel seems to have a good pace, but Cara Maria struggles to make holes in the wall, even with her good hand. So Laurel wins, but after defeating Cara Maria she hugs her and says “sorry.” Cara knows the apology isn’t for her victory, and the two depart on good terms. The cast is leaving Uruguay! Theresa, Nany, and Johnny R. celebrate their first location change, but the other five cast members know that changing locations means difficult battles. The cast is heading to the Andes Mountains in Chile, and when they arrive at the house Mr. Bananas immediately notices one thing… there’s an active volcano in the distance. This shouldn’t be a coincidence. Surprise! There is one more draw before the final. 2 kill cards, 2 blanks. Zach flips first… blank. Nany flips second… blank. Johnny R. flips third… blank. Devyn flips fourth… blank. So the final battles are between Laurel & Theresa and CT & Bananas. We see a new elimination named Puzzle Pyramid. Competitors must successfully complete 3 puzzles before the opponent to win. First Laurel and Theresa go, and Laurel gets a quick lead until Theresa closes the gap. On the final puzzle, Theresa calls for TJ thinking she has completed it, but she’s wrong. Laurel calls TJ, is correct, and wins. Johnny and Bananas go next, and Johnny holds the lead throughout all 3 puzzles. He wins a no-so-epic battle against CT. So Theresa and CT are gone. TJ breaks down the rules of the final. 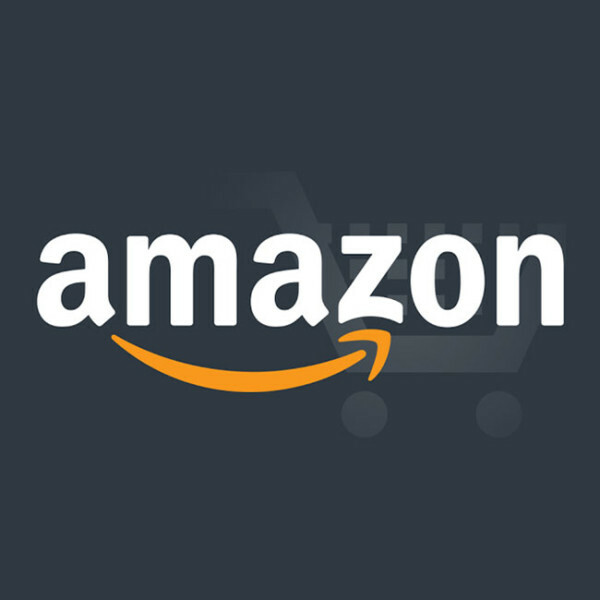 There are 5 stages, 3 partner stages and 2 individual. All of the boys are terrified of being paired with Devyn, but TJ breaks the news that the partners change at each stage. So every guy will complete a stage alongside every girls. The times from each stage will be added together and the individual with the lowest overall time wins. However, you must complete the final to get your check. First place gets $125,000, second place gets $35,000, and third place gets $15,000. The first stage of the final requires pairs to row down a river together. 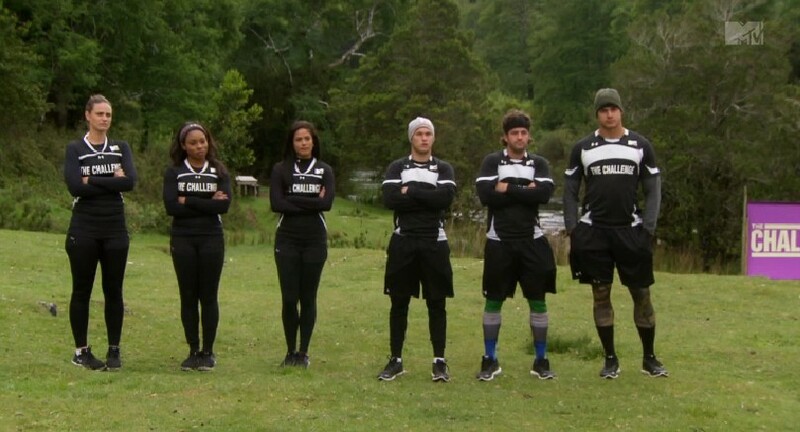 The pairs are Johnny Bananas & Laurel, Johnny R. & Nany, and Zach & Devyn. Bananas and Laurel get an immediate lead, and get far ahead of their opponents. Johnny R. and Nany seem to be fighting the rapids with some struggle, but they’re staying afloat. And then there’s Zach and Devyn who seem to have no control of their kayak. They’re spinning, going backwards, and eventually capsize. 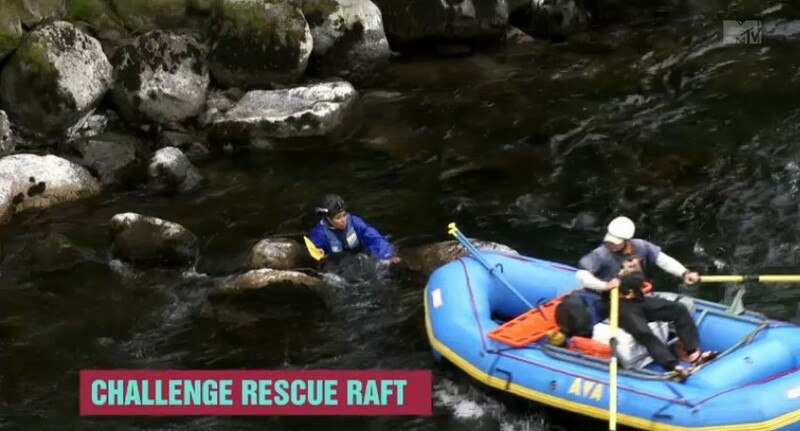 The Challenge Rescue Raft gets Devyn, but Zach cannot be found. Can Zach make up time for this disastrous first leg of the race? Or will he just drown? The final continues next week. I still can’t get over the fact of that Johnny and Devyn are the luckiest people in challenge history and got free rides to the final. The puzzle pyramid would of made a good elimination but add harder puzzles. The final elimination should of been Oppenheimer or Balls In because Johnny vs. CT and Laurel vs. Theresa would of been epic. That’s a good idea! Agreed that the pyramid challenge was an interesting premise, though. Uuuuuugh. I’m so sad that my dream team of CT & CM did not make it to the final! That was a tough loss for CM to swallow but I’m glad that she and Laurel were able to have a moment afterward. I just hate that CT is out of the running. He worked so hard and he usually excels at puzzles. I can’t imagine how difficult that must have been to accept but he handled himself gracefully. I’ve been re-watching old challenges recently and its remarkable how much CT has calmed down this season, for the most part holding his temper when pushed by others or disappointed. I think that Laurel and Johnny Bananas are going to win the final now that CM & CT have departed. Very anticlimactic final elimination in my opinion. Puzzles are fine, but I’d rather see them work to grab the puzzle pieces, and then complete it. Personally, I think they should have saved the challenge from the previous episode, Crossover, and use that as the last elimination. Or something to that extent. That would have been much more epic.